Pakistani national Fatima, who had been lodged in the Amritsar Central Jail with her daughter Hinna and sister Mumtaaz on smuggling charges for over 10 years, has finally walked free. 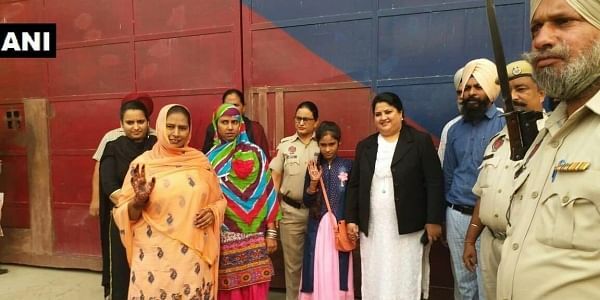 AMRITSAR: Pakistani national Fatima, who had been lodged in the Amritsar Central Jail with her daughter Hinna and sister Mumtaaz on smuggling charges for over 10 years, has finally walked free. The two ladies were nabbed by the Indian security agencies on smuggling charges. Hinna was born and brought up in the prison. They are now set to reach their homeland, Pakistan, through the Attari border after a decade. "I want the Indian prisoners nabbed in Pakistan to return to their home as well. I thank lawyer Navjot ji and Prime Minister Narendra Modi and salute entire India for their help," Fatima said. Hinna, who has never been to her home, was also elated. "I am very happy that I will return to my home and meet my father," she said. Fatima sister's, Mumtaaz, said everyone, from police personnel to the government to PM Modi, helped them throughout the journey and that they were delighted to return home. Lawyer Navjot Kaur Chabha, who had been working on the case since October 2016, said she was happy her struggle didn't go in vain. "Hinna has been released after a very long struggle. She is the reason I took this stand because the little girl was suffering from no fault of hers. Today is my Diwali," the lawyer said. Chabha acknowledged Prime Minister Modi's help in the case. "I had written a letter to the prime minister on Hinna's behalf. This is a matter of extreme delight for us that the Indian Government intervened and released her. Hinna is very happy that she will go to her homeland now and meet her father and the rest of the family," she said.